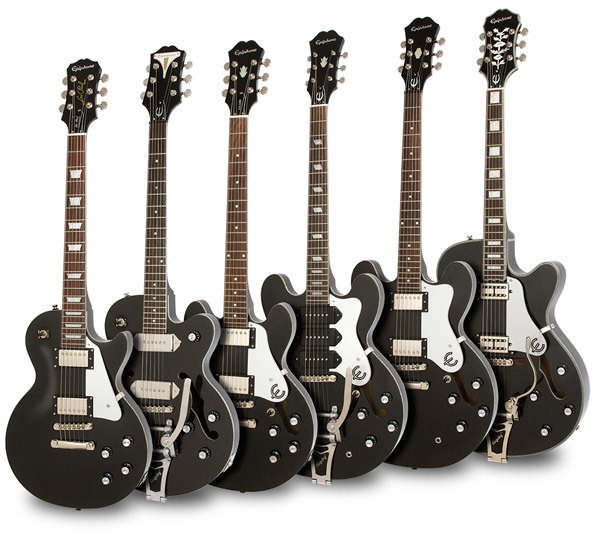 The Epiphone Riviera Custom P93 Black Royale is modeled after one of Epiphone’s most enduring classics, the Riviera. Over the years, the Riviera has been seen with humbuckers, mini-humbuckers, and P90’s. But now the P93 Black Royale has the rare distinction of giving players a new sound and a new, distinctive look. The Riviera Custom P93 Black Royale uses not two but three Epiphone “dog ear” classic P90 pickups with Alnico V magnets for a punch that leaves all other three single coil pickup guitars in the dust. Like the Riviera P93 Black Royale and want to see it in the Hall of Fame? Rate this guitar now (click on the stars below)… at least 20 votes with over 75% average rating gets this guitar into The HOF – the Guitar Planet Hall of Fame and from there into the Guitar of the Year award.